You are currently browsing the The New Lyke Wake Club blog archives for June, 2018. Crossing Report. Saturday 23rd June 2018. Time taken 13 hours and 38 minutes. We set off from home at 4.00, our support crew picking us up with a car laden with supplies. 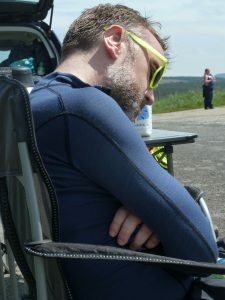 Alex had prepared a Yorkshire quiz for the journey in an attempt to awaken our fuddled sleep weary brains, (Bevis had been out partying all night, oh to be young enough to party then walk 40 miles.) The quiz highlight was Bevis’s answer to Ilkley moor bar t’at, being on the moor without your bath mat. He’s a Yorkshire man he should have known the answer. We pulled into the carpark in Osmotherley touched the start stone and were off by 5.30 am just as the sun was rising over the hills, ready to meander up the first few climbs of the day. 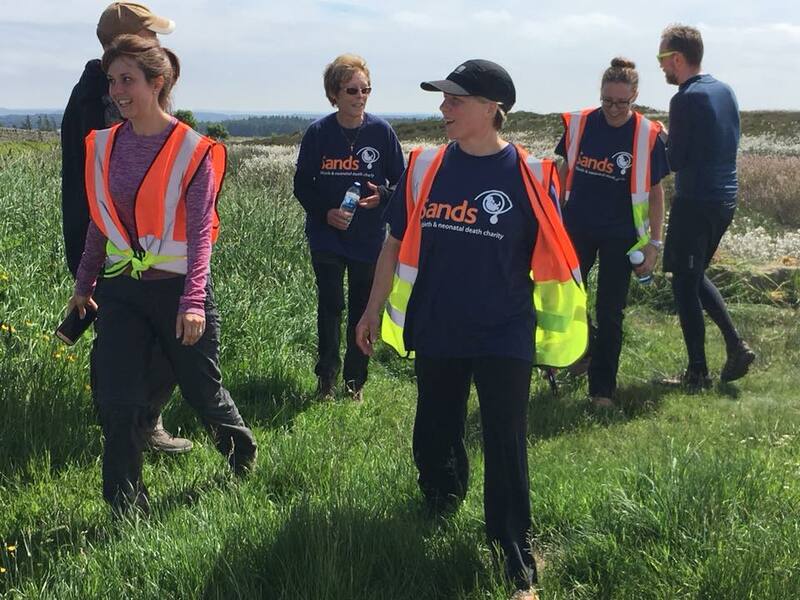 As we tromped up Carlton Bank, we came across a large group of charity walkers spreading out down the narrow path, moving slightly slower than we were. To pass them we almost had to jog up the hill and we were very amused when they shouted to each other to move out of the way, as some “Speedy Speedsters” were passing. We certainly wouldn’t have viewed ourselves as that and we never jog up hills on long walks, but the jog kicked in some adrenaline and we carried on at a good pace. We ignored check point one and made good time to the second checkpoint, arriving at 8.25 to the smell of freshly brewed coffee and Alex grinning and asking, “What took you so long”? We laughed as our legs were still going strong at this point. After a brief stop, talc on hot toes and change of socks, we changed boots here. We had walked the first half of the walk a few weeks before and Bloworth crossing had been hard on the feet, so we wanted something a bit more padded between our toes and the cinders. Little did we know that much of the second half of the walk would be hard on the feet, there are some very sharp rocks on this route. We set off towards Round hill and the highest climb of the day, still feeling strong and our feet in good order. 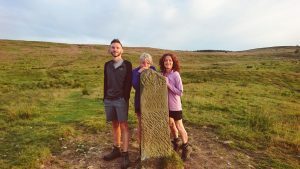 We hated Bloworth so much that we were pleased to have read on the updates to the route that we could knock a chunk off the crossing, because the old path across the moor had reopened. We trudged along the crossing keeping out a sharp eye for the turn up towards Rosedale Head. There is a LWW stone in the ditch, painted yellow marking the way, which we found after we had turned onto the path. Now, you would think having mapped this new path on our phones we would have managed to walk what is in effect a straight line upwards without much trouble, unfortunately two paths start from the same point and we took the wrong one. We went right instead of left along, a rarely walked path, so lots of scratchy heather and walking with knees as high as possible, through squishy bogs, (we would probably have looked like drunk Charleston dancers to anyone watching.) We saw the standing stones leading up to the road in the distance through a heat haze and cursing loudly set off towards them. I think we still felt that this turn off, had been worth it though. We arrived scratched and covered in black streaks at Rosedale head at 11.30 to more freshly brewed coffee, and sandwiches. We changed back into our walking boots, more talc and fresh socks then set off with a spring in our step towards Fat Betty. Oh, the temptation to jump into the car and cut out the tarmac section as the support crew gaily peeped their horn on the way past. Fat Betty is amazing, we didn’t realise that people left offerings here for other weary walkers, plasters, fruit, moleskin, so dug into our pack to look for something suitable then set off down the road towards the next turn off by the looming standing stone. 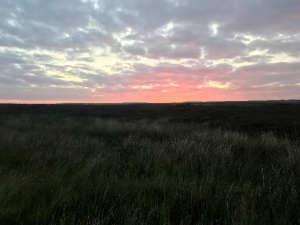 We approached the bog section with trepidation, but as there had been very little rain they were mostly dry, (the odd squelchy section still caught us out through.) As we walked along the channels, we were in awe of anyone tackling this when the bogs were full. The bogs baking in sunshine were a pleasure on the feet as we bounced along the springing turf. We had a quick check in at Shunner Howe with the support crew but as we hadn’t needed to do any wading, we still had dry feet and set off towards the Blue Man in’t Moss. A quick touch of the stone and we were off again towards Howl Moor and Simon Howe. Ow, ow, ow, is all we can say about this section, those rocks are sharp, and so close together that your ankles get a good work out. We had been looking out for Adders, desperate to see some, but I think Bevis must have been sleepwalking at this point, (partying catching up on him.) He let out a piercing howl and jumped several feet in the air when he disturbed a sheep in some bushes, thinking it was an Adder. Lots of rib pulling about Adders not being the size of pythons followed and the laughter set us up for the steep descent of Simon Howe. I slipped on the way down and popped my shoulder out, Bevis and Julie were both nearly sick, as unfazed I popped it back in, but I have been doing this since childhood. We reached the last checkpoint and dropped our bags in the car, then set off towards the Radio Tower and the finishing stone. I think we had a new burst of energy here, as it did seem easier walking than the last few miles. As we approached the end of the path Alex and Ben were whooping and waving and had covered their car in congratulatory bunting, and were holding up Witches and Dirger placards, which really cheered us on to the end. 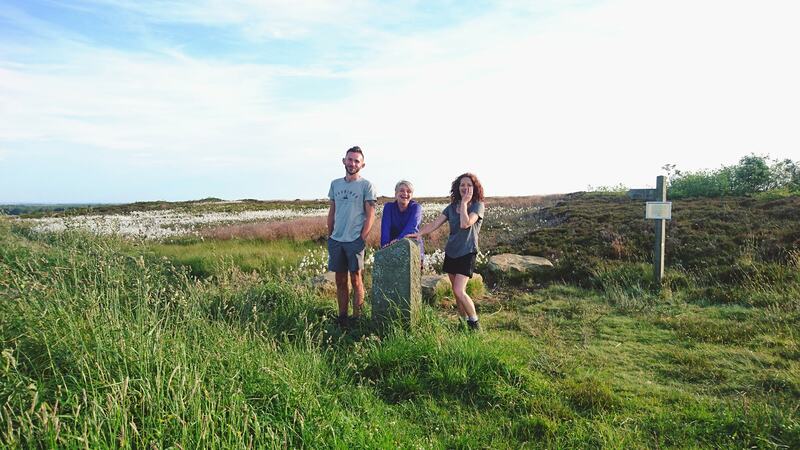 We touched the finishing stone at Ravenscar at 7.08pm, sunburnt but with smiles on our faces, 13.38 hours after we began. Would we do it again? Who knows, we are seasoned walkers and this was a hard slog. Quite frankly, only laughter gets you through the tricky bits. West to East Cutting Slightly North of the Lion Inn. Distance 38.72 miles, time 16h:44m. This was my 4th attempt and 3rd successful completion of Lyke Wake Walk the last ones been in the early 90s. I found this one much harder, perhaps as its over 20yrs since my last crossing… What can I say other than knees not what they used to be.. 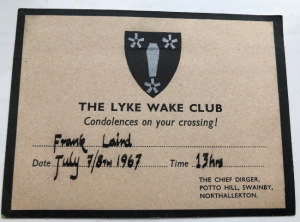 This was my first attempt at the Lyke Wake Walk. Over the last few years I have done several trail running events on the North York Moors, starting with the Osmotherley Phoenix and then 6 or 7 Hardmoors events. The LWW seemed like the obvious next step and allowed me to see parts of the moors away from the Cleveland Way for the first time. I remember when I was little my Dad talking about his crossing and despite ending up waist deep in a bog, how much he had enjoyed it… Later in life our small group started talking about planning our crossing together, though talk was pretty much where it ended for some time… It wasn’t until my Dad’s wake in February and the fact we we’re all together for his funeral we decided to finally fix a date. Closest weekend to the 21st June that we were all free, to give us the longest day. This worked out to be 16th-17th June, Father’s Day which seemed strangely fitting. 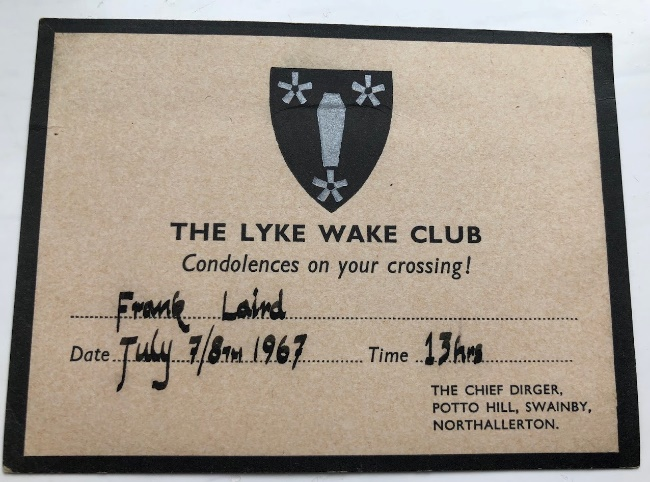 My Dad’s condolence card pictured below (he was 24 at the time). 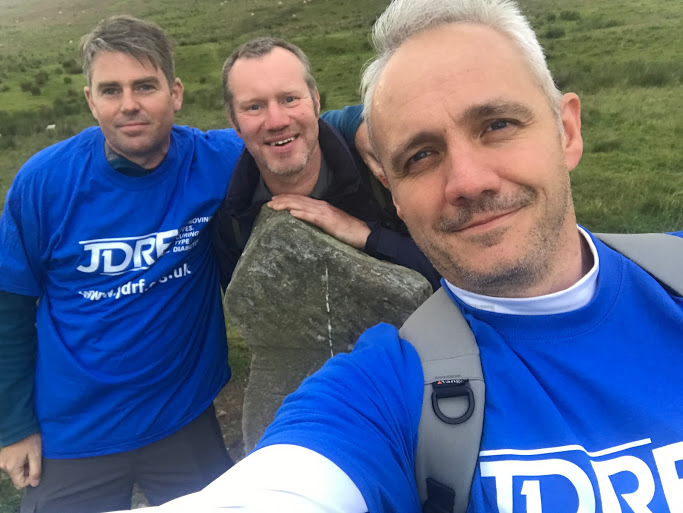 As time marched on towards the date, while taking on the challenge predominantly for ourselves, it seemed like a potential missed opportunity if we didn’t at least try to do it for a good cause. One close to my heart and with a father son link being JDRF. 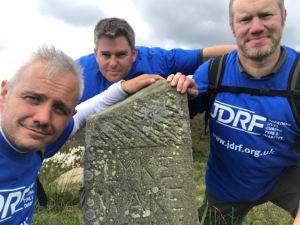 Having nearly lost our youngest when he was just 1yr old to Type 1 Diabetes this seemed and obvious choice and to date the total raised has been £905 plus £166.55 Gift Aid. After a few practice walks the day finally arrived and having discussed the need for a break at about the half way point we met up @ 7pm just north of the Lion Inn to drop off one of the cars, equipped with camping stove, bacon, buns and other items such as spare shoes, socks, water and anything else we may now need. Then back to Osmotherley ready for our start @ 8:20pm. 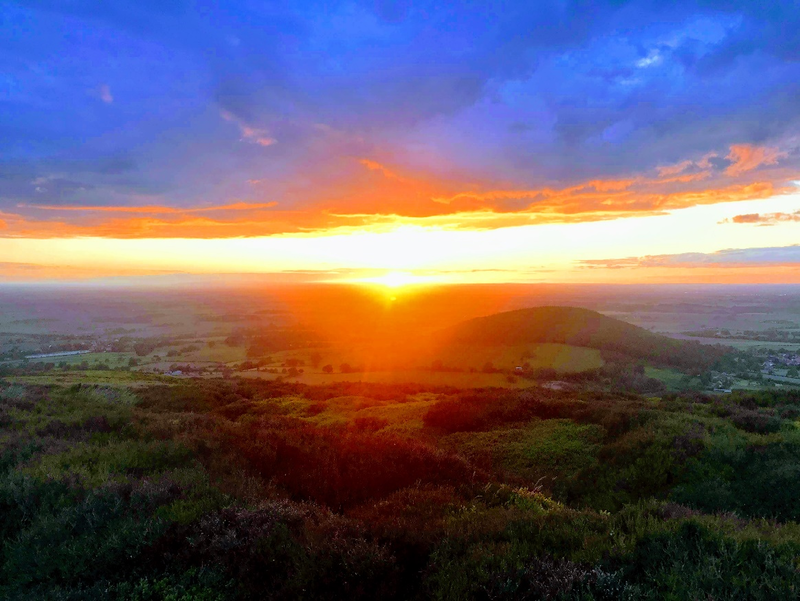 Having been fairly overcast with thunderstorms earlier in the day as we approached Carlton Bank the sky cleared just in time for the sun to set and what a view..!!! By the time we reached Lordstones the sun had pretty much set and it was time to choose high path or low path. Given we’d only covered a few short miles and were all still fired up it had to be the high path, though I suspect if we had crossed East to West the opposite would have been the case and in hind sight the steps down at clay bank were not knee friendly. After refuelling it was back on track though the pace started to slow as we hit the rocky terrain and the bogs. 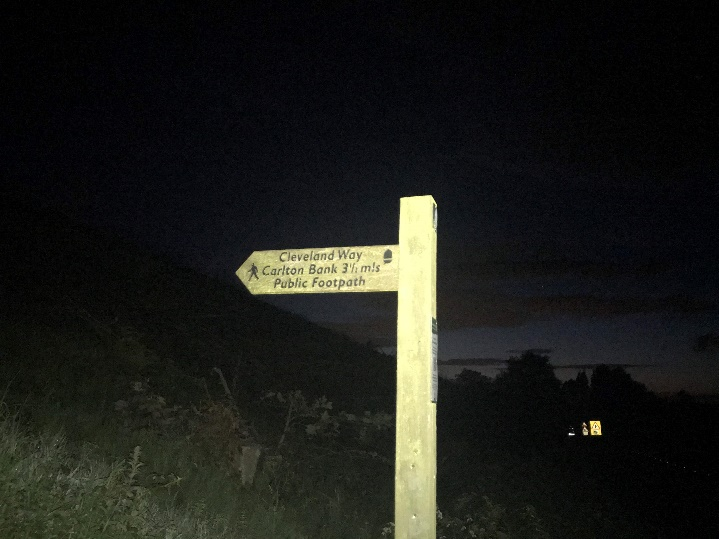 After a few slips and misplaced feet, it was clear no one was finishing with dry feet, and after passing the early warning station at Fylingdales the pace slowed further. With only three fully operational knees between us by this point it was slow going. Still we pushed on eventually touching the Ravenscar stone little after 1pm. 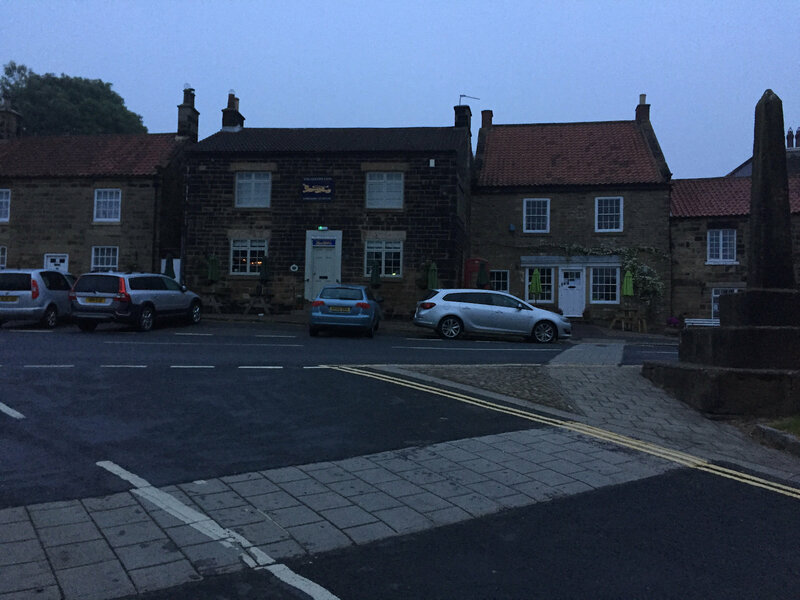 Dry clothes, shoes and fish and chips awaited us with our ever supportive other halves…!! ‘How old are you again?’ he asked. ‘I’m doing it a week before my 72nd birthday’ I replied a bit truculently. Since the advice I tend to listen to is my own, I paid no attention and consequently, with our three wonderful guides, Tom and Claire Chapman and David Allen, I was part of the 13 LWW virgins, including my daughter, that set off in high spirits at 9pm, pleased to be on our way and out of the range of persistent midges. Unlike other Crossing Reports, I can’t detail just where we were, at what time, what conditions were like in X wood or Y hill. 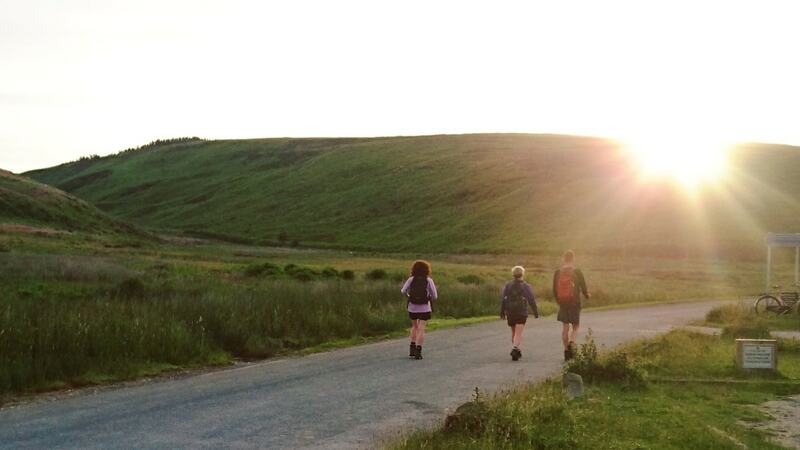 All I know accurately, is that we started at Osmotherley and all but 3 ended at Ravenscar. 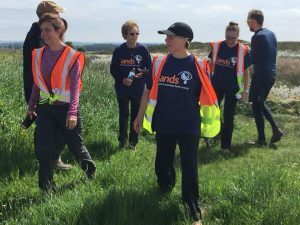 I apologise to experienced Club members for any inaccuracies, but like one lady whom I had met on a training walk who had completed a crossing ‘Oh, many years ago’, I can with clarity remember starting and ending – but the bit in between is a bit of a blur! In fact she said ‘horrid blur’ – but, apart from a handful of occasions when I wished my heart and lungs were 40 or even 20 years younger – I generally loved the whole experience. I can though, describe some of my personal thoughts and impressions. 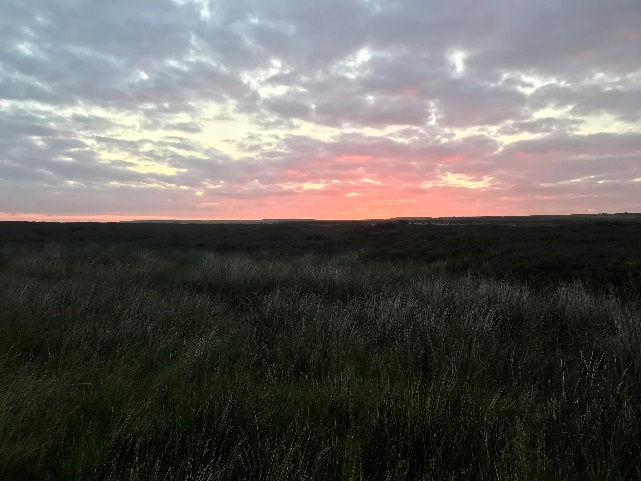 We all admired, still as a single group, the sunset to the north, as we walked through Coalmire woods, though I was pleased to stop for photographs as I reckoned we were walking at a fair fast pace. On reaching the first hill, we spread out and, to my surprise, I still found myself towards the front. Someone then asked me if I’d practiced walking at night. My vast experience of my head torch extended from me walking from kitchen to sitting room and back and deciding I didn’t like that torch, so I carried a hand one instead. In retrospect, I think I should have persisted – though with the light of others’ head torches, we managed to get to our first checkpoint and waved and flashed our lights to guide the second group home. 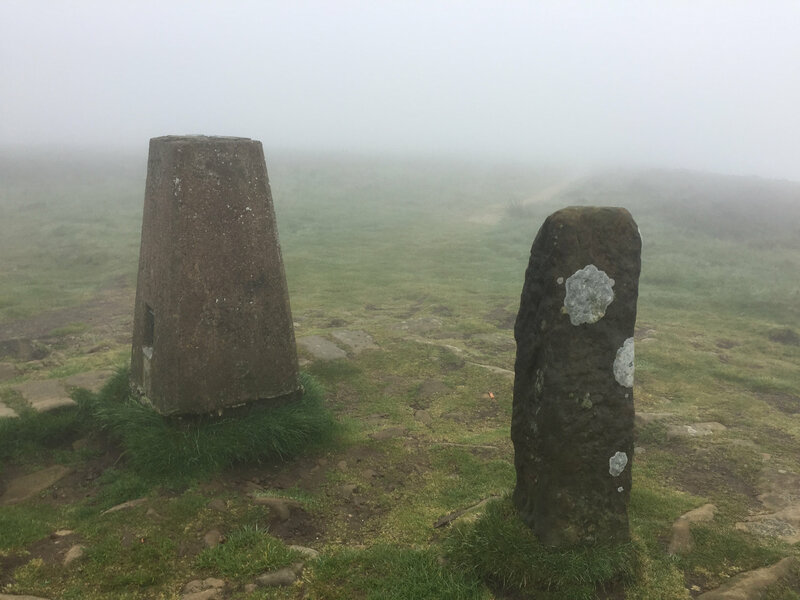 I wasn’t looking forward to climbing up Cringle Moor, but in fact we skirted it, picking our way carefully trying not to fall in the drains and just grateful that at least the stones were dry. We collectively shuddered at the thought of rain or ice and then reached our second checkpoint where hot drinks and sweet things were served. With the temperature having noticeably dropped, I successfully managed to blag my way into the warm of the support van on account of my age! We eventually cut off the railway, and after some considerable guide pondering on the right unmarked route, we eventually trudged rather wearily along the road to Rosedale Head until seeing the support van loom out of the mist and I again had no compunction in playing my second Joker to get a seat in the warm. The rest of the group were visibly shivering. After setting off, I made sure that I gave due obeisance to Fat Betty, though thankfully she turned down the remains of my ‘Trekking Bar’ in my pocket. We were excited and nervous about the ‘boggy section’ to come, which afterwards, our guides said was the driest they had known it. It didn’t seem dry to us, as most of us ended up with having to change out of our soggy socks at checkpoint four! I attended to what I thought might turn into blisters – my only physical problem during the walk. It was at this checkpoint, I think, that the leading group decided to stock up on the pile of just cooked bacon into the rolls provided. I pounced, overfilled my butty, grabbed a seat and called out my order for a cup of tea. And I gobbled it down. I’ve never been very good at exercising after eating! Dave, the guide at the front, pointed out the Blue Man-i-th’-Moss to me and we then speeded up to catch up with one ‘mountain hare’ in front. I wasn’t feeling too good, and then just behind the leading pair, I threw up. ‘That delicious bacon butty’ I thought, but immediately felt better and caught them up, saying proudly, like a six year old, ‘I’ve just been sick!’ They were duly solicitous, but I felt much better and we motored on. Before Simon Howe I was sick again, and again felt a lot better. Then, excitingly, there was a chance of seeing the Moors Railway train pass in front of us so of course we ran, just to see a wisp of smoke in the deep embankment below as the phantom train trundled towards the coast. And so to checkpoint five and another long wait for the others in our group to catch up in order that we could leave together. There was a pull up towards Lilla Cross and it was soggy and energy sapping as I remember and just before that landmark from where the finish of the walk can be seen, I did something I’ve heard about, but never experienced either as a participant or as an observer… I projectile vomited almost the whole of the bacon butty that remained in my gut. I was no longer in the front group at this point, but just with my lovely daughter and Charlie, the son of my local MP, Kevin Hollinrake (a great supporter of the cause we were walking for). At least I was useful in adding to his life-learning experiences and because of that thought, and with a blissfully empty stomach, I now felt good again, and as traumatised Charlie waited for his parents, the pair of us powered on. However, it felt, for my daughter and me, a long way to the next checkpoint, wherever it was! At the end, my daughter reminded me to touch the final LWW coffin stone – otherwise I wouldn’t have completed the crossing and presumably, would have had to turn round and go back to Osmotherley! It was great. We were elated. We had done it (17 hours and 43 minutes) and we cheered in the rest of our group that followed. I know we all felt emotional at the end because we had pushed ourselves both physically and mentally. We had hit our personal walls at various stages but had climbed over with difficulty and dogged determination. We had passed! Oh, and there’s still life in this old dog. The walk didn’t put me in a coffin – though that would have been pleasingly symbolic! PS: When can we do it again? Crossing of one Stephen Scorer on May 30th 2018. 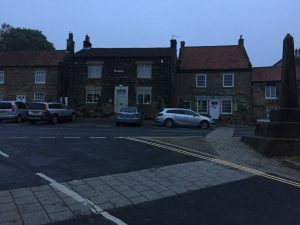 Just before sunrise on the morning of May 30th, 2018, a figure was seen to skulk out of The Golden Lion public house and stagger across to the churchyard. A black and white cat is believed to have been the only witness to the doleful deeds that transpired prior to the departure of this soul. As the church clock tolled at 4.30, I left the church yard, walking up North End and was quickly consumed by a motionless and mournful mist. The dam at Cod Beck stood like a gothic pile as I pushed on towards the stone marking the beginning of my journey to the other side. Soon enough, the tombstone like marker emerged from the mist, the letters, LYKE WAKE WALK, scored into one side. The trial was about to begin. Soon I entered Clain Wood, paying respects to Mr Cowley as I passed through. In the depths of the wood I felt a tingling trickle down my spine. I was sure that someone, something was watching me. I kept on walking deeper into the wood and saw a tall, dark apparition appear in the fog. I walked closer in silence, was it a bush, an animal another being? Suddenly, cloven hooves propelled a deer into the trees. Progress to the Carlton Bank trig point was good, I kept my head down, focussing on the few feet of path I could see. As I dropped down to Lord Stones, the mist lifted a little and I could see some of the new buildings by the path. 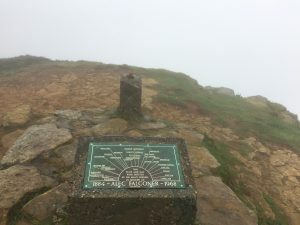 On Kirby Bank, I sat in Mr Falconer’s seat, looking out into thick fog. The plaque said optimistically that Penshaw Monument, a landmark near my childhood home, was directly in front of me. Sadly, I would have to enjoy this view another day. 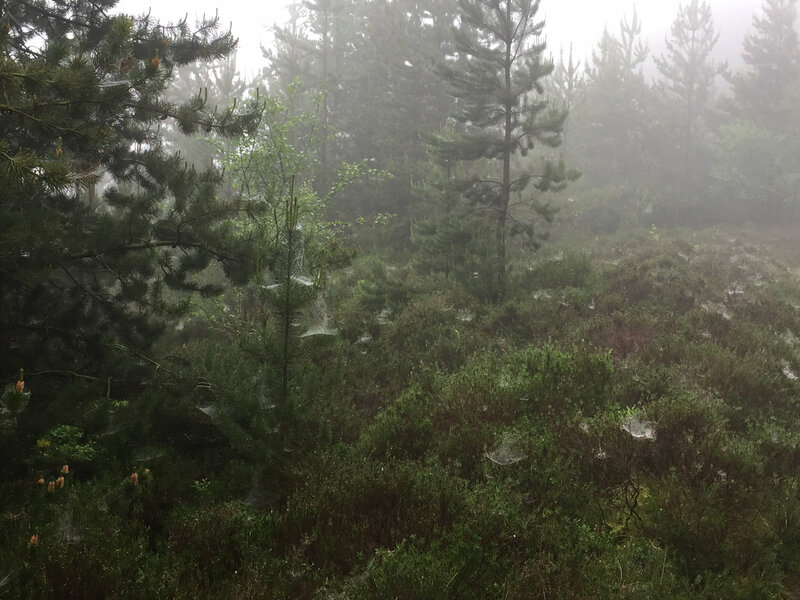 Dropping down to the Broughton plantation, pine trees were covered in a phantasmagoria of mist bejeweled webs until suddenly, I found myself in a wasteland, smashed branches and tyre ploughed earth showed a recent harvest churning the earth in a mass of destruction. Heading up to the old train track, the wind stiffened, blowing thick mist like wet smoke across the track. As the wind gusted from the north and from the east, the cold wet seeped in to me, penetrating waterproofs and chilling. I pressed on along the interminable track, unable to see much around me. The track seemed to go on for ever until, eventually, I hit the junction and car park at Little Blakeley. I’d totally missed the turning to The Lion Inn and had to walk along the road. Annoyed at myself for missing the turning, soaking wet, cold and hungry, I almost walked past the inn. 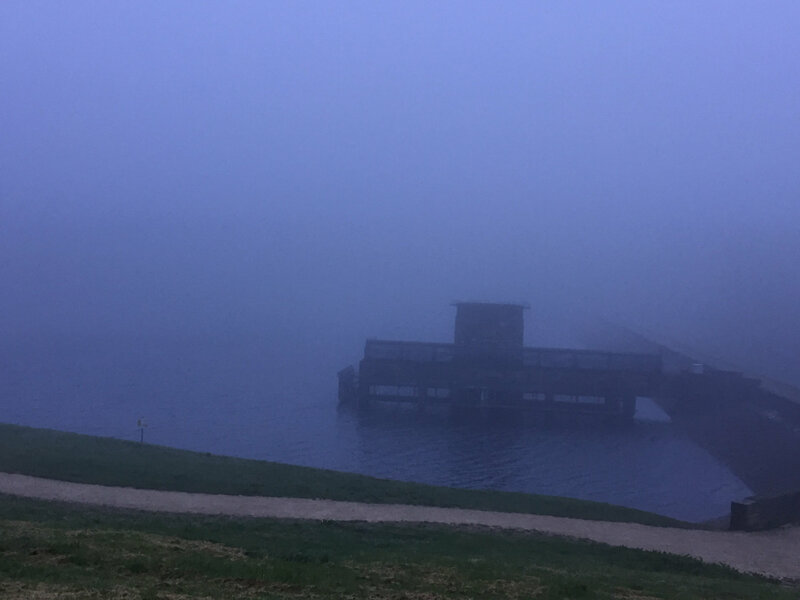 I happened to look up and noticed a light in the mist, I then saw the sign and found my way into the warm heart of the Lion at 1130. 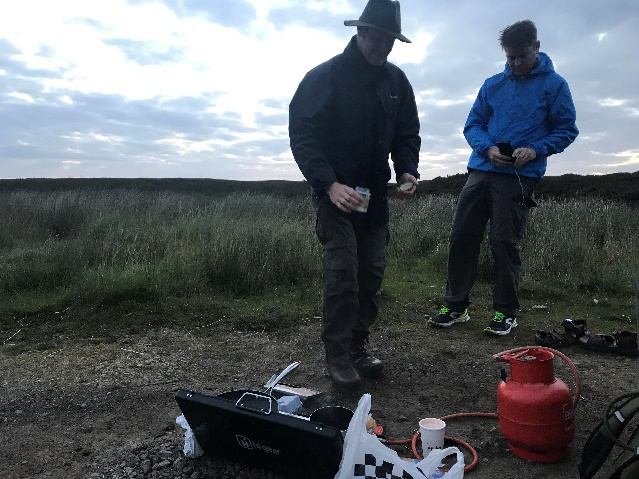 After two hours in front of a fire, drying out, warming up, drinking hot chocolate and eating chips I was ready to set off for what I knew would be the more difficult part of the journey. By this point, my phone was on its last legs, a heavy power pack I had been carrying to try to feed the device had failed and the charger lead had also died. I wanted to keep the little power my phone had left for emergencies so I knew that for the rest of the journey I was to be totally alone.regardless at 1330 I set out once more into the mist, refreshed but concerned about the infamous bogs and worried about my ability to navigate safely in such conditions. As I approached Jugger Howe, the mist seemed to miraculously clear. I saw a fence ahead with a sign saying Jenny Fell…..poor Jenny – I hope she didn’t do herself an injury. 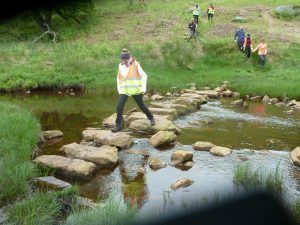 I crossed the beck and had a fantastic view of the steps up onto the moor. Gee thanks! 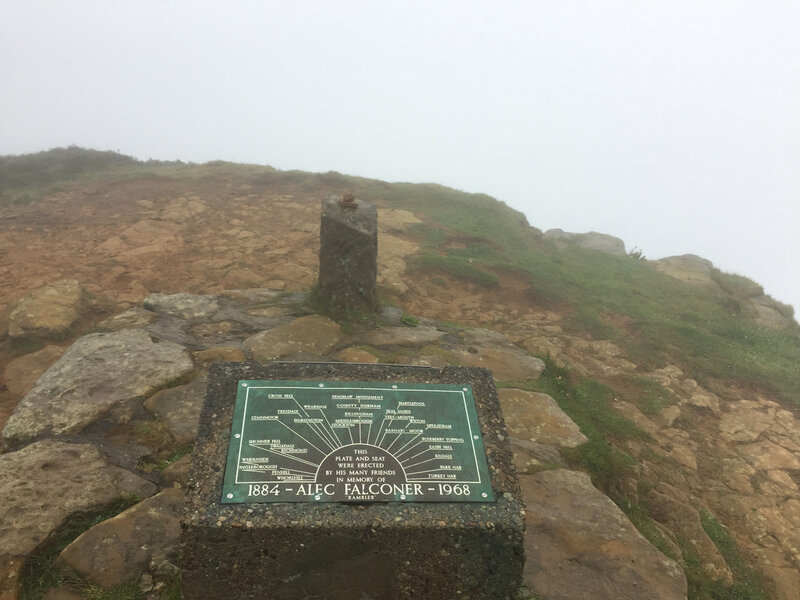 Once up the steps, down came the mist and the final slog to the mast and the Ravenscar stone. Throughout the walk I had seen very little apart from the track in front of me. As I approached Ravenscar, I was sure I saw the mast several times to find that I was actually looking at trees. I’m sure I was attended by phantom visitations several times in my mist bound crossing but was sadly unaware as I pressed on, desperate to get to the warmth of Raven Hall. Finally, I saw the mast appear out of the mist. As I passed, I touched the Ravenscar LWW stone and a few seconds later, my watch that had been tracking my walk gave up the ghost. Exhausted after 17 hours 24 minutes and 38 seconds of tracking my movements. It said I had walked 44.68 miles and was later to give me a route map of my crossing to the other side. It was 9 50 pm and still light……just about. I walked down to Raven Hall where I had booked a bed for the night and checked in, wet through and tired but incredibly exhilarated to have completed a journey I had wanted to make for years. 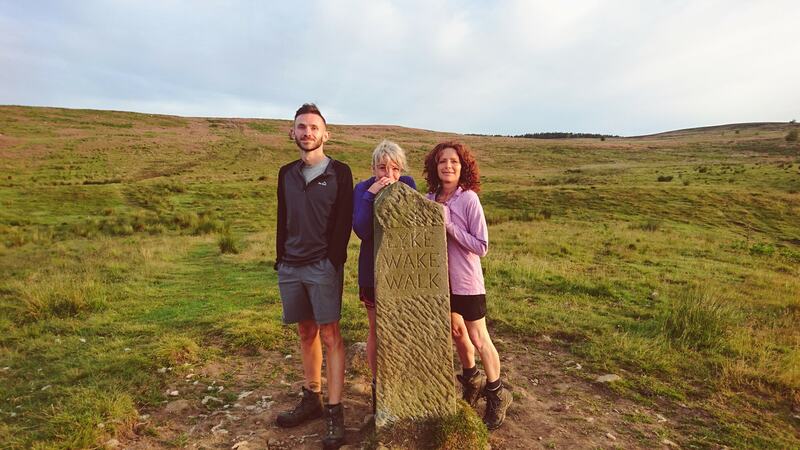 Please do graciously consider my request to be accepted as a Dirger after walking alone and unsupported from The Golden Lion, past the Osmotherley Lyke Wake Stone to the Ravenscar stone in 17 hours 25 minutes. A journey accompanied by dense mist at all times apart from the descent to the stream at the foot of Jugger Howe. 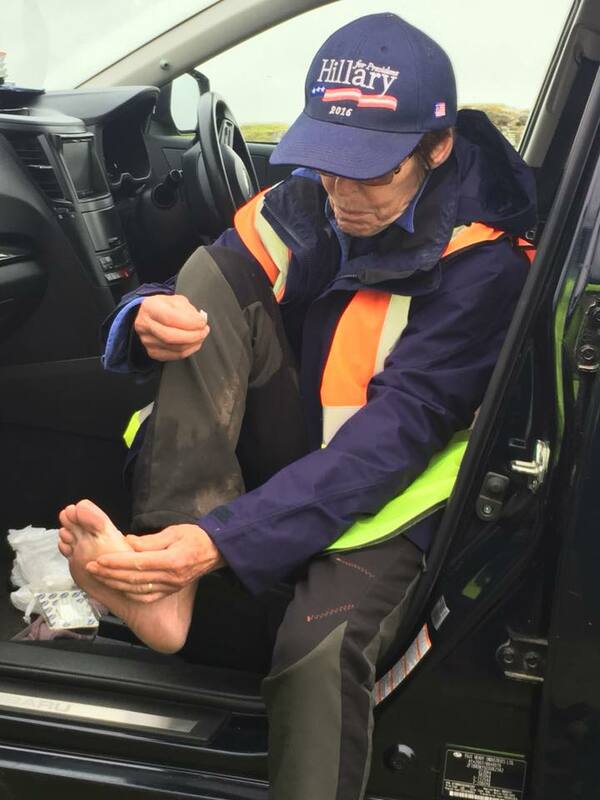 Posted in Crossing report | Comments Off on Crossing of one Stephen Scorer on May 30th 2018.